Chatham light marks the southern entrance to Chatham Harbor, in Chatham. It is off Main Street from Route 28. Chatham originally had a pair of range lights used to guide the increasing whaling and shipping traffic around what is known as Cape Cod's "elbow". The Chatham Range lights were built at Chatham Beach as two wooden light towers in 1808 to mark the dangerous shoals offshore around this area and to distinguish the site from the single light at Highland (known today as Cape Cod Light) to the north. In 1841, these original wooden lights, which were gradually decaying and becoming dangerous for the keepers to climb to the tower, were replaced by a set of brick towers on the bluff. With Chatham's location, it was constantly exposed to the powerful storms that caused dramatic changes to the shoreline and produced rapid cliff erosion. It was also one of the foggiest areas on the Massachusetts coast. A fierce storm in 1870 caused a break in the offshore sandbar, and dramatically eroded the bluff beneath the towers. The towers survived until 1879, when too much erosion caused the south tower to collapse over the bluff and onto the beach below. Later, erosion destroyed the North Tower and Keeper’s house in the Spring of 1881. Again, another pair of lights were installed at Chatham—this time of brick-lined iron design, and located much further back from the water. 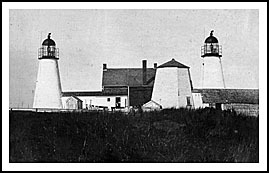 In 1923 the north light at Chatham was relocated up the beach to become what is known today as Nauset Light, leaving the single light used today as Chatham lighthouse. Erosion still continues along Chatham's sandy shores. The town of Chatham sits on the elbow of Cape Cod with many well-preserved 18th century historic homes and buildings, and museums. Chatham offers free Friday night band concerts in the summer months, beaches, parks, a scenic 4.5-mile bike trail, and nature trails for wildlife enthusiasts. Chatham's Atwood House Museum features the lantern house from Chatham’s twin light with its original Fresnel lens, which flashes its beam whenever the museum is open. Visit the Chatham Railroad Museum, housed in a restored 1887 depot, and there are three other local museums to explore. The Coast Guard Auxiliary offers frequent tours inside Chatham Lighthouse; the grounds are open year round. keep in mind it is extremely busy in the area during the summer season. 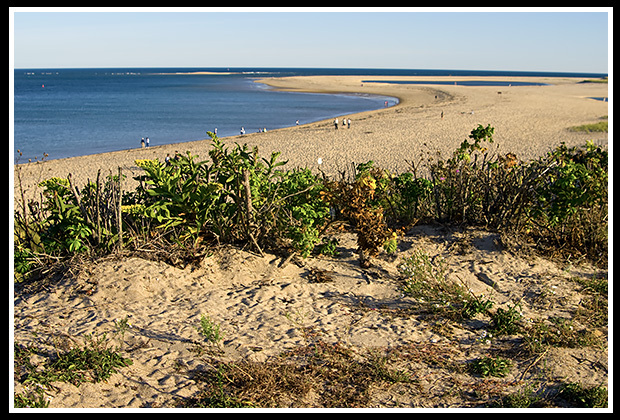 For enjoying natural wildlife, visit the Monomoy National Wildlife Refuge. Take Route 3 South (Southeast Expressway) in Massachusetts to Route 6. Follow Route 6 over the Sagamore Bridge to Exit 11, then onto Route 137 towards Brewster and Chatham. Follow until you will take a left on Old Queen Road to Route 28 (Main Street). Take Route 28 to the roundabout in Chatham, and from there follow Main Street through Chatham. Main Street will make a sharp right turn when it intersects with Shore Road. From this point, go south on Main Street about a half-mile to the lighthouse. Boat cruises and ferries mentioned below may offer many types of cruises. While some may offer specific lighthouse cruises, some will pass by specific lighthouses as part of charters, narrated wildlife and historic tours, ferrying passengers, whale watching, fishing tours and other types of excursions. Contact info is provided to help you plan your special trips to New England’s shorelines. Enjoy! 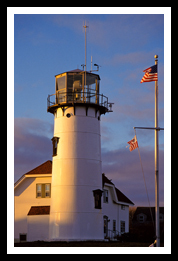 Guided wildlife and lighthouse tours that go past Chatham Lighthouse and Stage Harbor Lighthouse. They also offer wildlife refuge tours that pass by the Monomoy Point Lighthouse, and ferry passengers to Nantucket Island. Guided Monomoy seal/nature tours, lobstering cruises & sunset cruises. View seals, Chatham's fishing fleet, Shore Road homes, North Beach, and Chatham Light. Departs from Chatham Fish Pier. You'll find all tours pass by Chatham lighthouse. Seal watching excursions that may pass by Chatham light. Harbor tours may pass near the lighthouse. 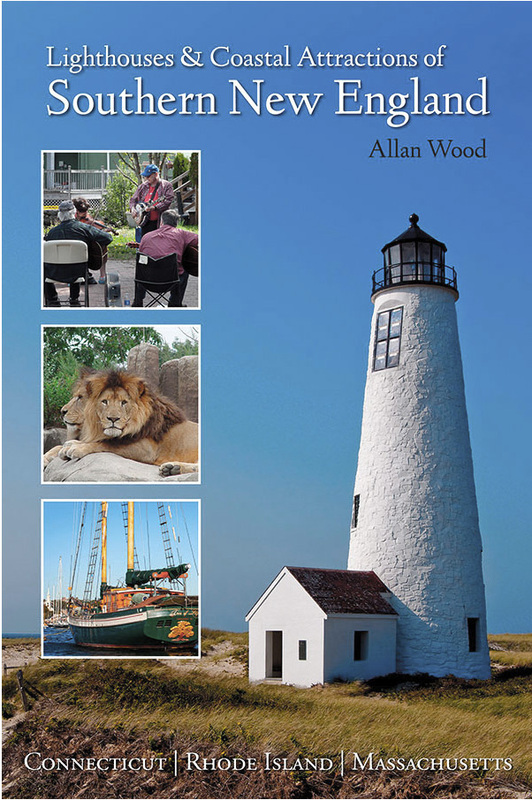 My 300-page book, Lighthouses and Coastal Attractions of Southern New England: Connecticut, Rhode Island, and Massachusetts, provides special human interest stories from each of the 92 lighthouses, along with plenty of indoor and outdoor coastal attractions you can explore, especially all around Cape Cod. I'll be happy to sign it for you here, or you'll find it in any fine online traditional bookstore.